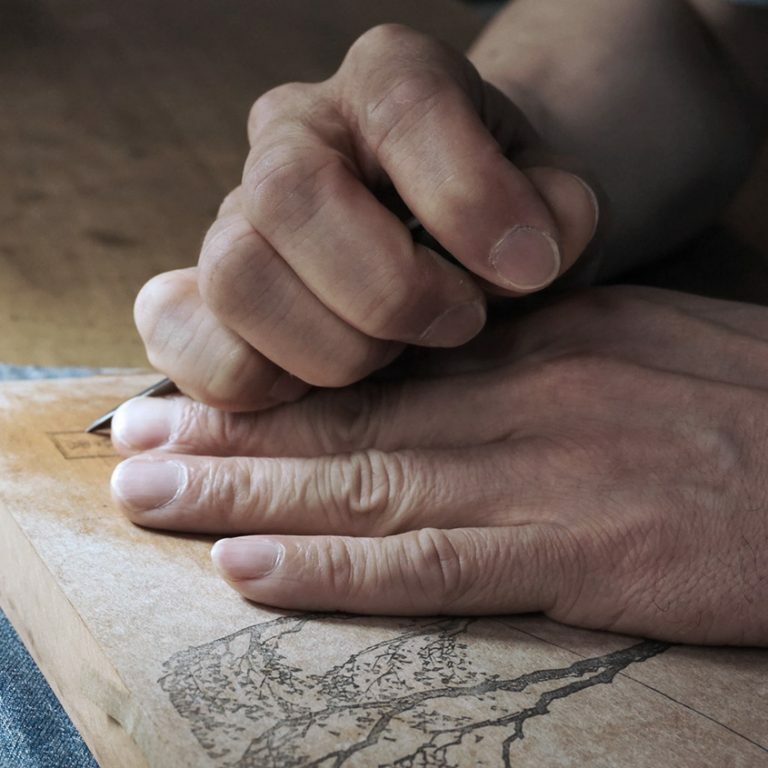 Following the inaugurate feature “Cutting deeply into the tradition of craftsmanship/ a portrait of master carver Shoichi Kitamura” I like to expand on the story of the iconic print The Great Wave little further and illustrate the idea behind Craftsmanship Soul – the modern voice for traditional crafts. Craft has been progressive all along by endorsing new materials, processes and concepts. The Great Wave, the most well known of woodblock prints, originally named Under the Wave off Kanagawa, from the series Thirty-Six Views of Mount Fuji, produced in 1830-1833 by Katsushika Hokusai, is a beautiful example of materials and concepts borrowed from far its origin. It is a remarkable story about Hokusai’s prints that were inspired by European style perspective techniques although Japan has remained secluded from the rest of the world for almost 200 years. When Hokusai was commissioned to create Thirty-Six Views of Mount Fuji a series of landscape prints depicting Mount Fuji from different locations and in various seasons, his ambition was to make the prints a hit. At his time the production of woodblock prints was cheap as it was the only reproduction method for all kinds of publications in Japan. Single sheet images such as The Great Wave were sold for little money in the shops and commercial success was measured in the number of impressions produced. It is estimated that about 5000 – 8000 impressions of The Great Wave were made. Hokusai’s publisher advertised the Thirty-Six Views of Mount Fuji as a series of landscape prints, a new kind of ukiyo-e (a genre of woodblock print during the Edo Period 1603 – 1868) that just became popular in contrast to the traditional subjects like portraits of kabuki actors, courtesans and geisha. He also made sure to advertise the prints as “single sheet aizurie”, printed with a newly imported aniline ink dye known in Japan as bero, Berlin Blue. The synthetic dye invented in Germany (in Germany terms Azurblau/ Colour Code #003171) was a more saturated hue than the traditional natural indigo dye. Bero was commonly recognise as an exotic novelty from abroad and added value to the print. Both the Berlin blue pigment and the effective use of visual perspective generated an atmosphere of departure. As Japan opted out from world affairs for almost 200 years there were already signs to the beginnings of the opening of Japan. Then in 1853 the country opened its harbours to trade after the American government forced their permission with their gunship diplomacy. Woodblock prints began to circulate in Europe and America. The Great Wave was a huge success in the West, some argue due to the familiarities in colour and style. Still the image fully epitomises Japanese art and sensibility and was again celebrated as exotic novelty. Until today The Great Wave illustrates that innovation not only follows the necessities of direct progress in materials, processes and concepts, but also searches beyond regional and national borders without loosing its own identity. The print’s hybridity seems to resonates in unison with the view of Kitamura-san, Kyoto based master carver, who believes that the integrity of one craft flourishes with the artisan skills and the deep understanding of every single material involved (read more A portrait of master carver Shoichi Kitamura). No doubt traditional crafts face great challenges in the 21st century. The term “traditional” however misleads in its perception and high regard as a modern craft with a long tradition of knowledge but also a will and confidence to innovate itself. Craftsmanship Soul likes to bring modern crafts to the forefront of design. Craftsmanship Soul promotes artisans and highlights technical and material innovation. Craftsmanship Soul wants to grow into an international platform for artisans to make their creative visions heart and to encourage collaborations across industries. As well as we wish to go far and beyond with the blog we like to keep focus on the essence of craftsmanship by ensure that people will continue to appreciate and recognise craft.